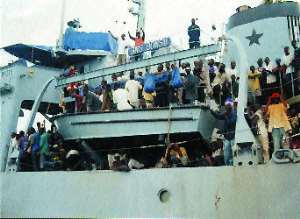 ....singing "Yen Ara Ye Asase Ni" Five hundred and ninety-two evacuees including 413 Ghanaians evacuated from Equatorial Guinea on the orders of President John Agyekum Kufuor arrived safely in Tema on Tuesday aboard two Ghana Navy vessels - GNA Anzone and GNS Bonsu. Other nationals evacuated alongside the Ghanaians were 179 nationals from the Economic Community of West African States (ECOWAS) made up of 146 from Mali; nine from Burkina Faso; six from Cote d'Ivoire and five from Benin, four from Senegal; two each from Guinea, Liberia and Equatorial Guinea and one each from Nigeria, Niger and Togo. Sixteen children and 14 women were among the evacuees. The returnees, who were in good health, started singing patriotic songs, including "Yen Ara Ye Asase Ni" and shouted "Ghana Ghana Ose Yie!" when they were told that the ships were about to dock at the Tema Harbour. The Minister of the Interior, Mr Hackman Owusu-Agyeman in the company of Mr Thomas Broni, Deputy Minister of the Interior and other officials from National Disaster Management Organisation (NADMO); Police, Ghana National Fire Service, Customs, Excise and Preventive Service (CEPS); Immigration Service and Bureau of National Investigations (BNI) were at the Tema Port to meet them. After inspecting both ships, the Minister said the evacuation exercise showed the Government's commitment to protect Ghanaians wherever they were or found themselves. Mr Owusu-Agyeman said Ghana did not shirk its responsibility as a member of the Economic Community of West African States (ECOWAS) and had demonstrated it by the evacuation of other ECOWAS citizens. He said the Government would ensure that other national were given safe passage to their countries of origin. Mr Owusu-Agyeman asked the returnees to be law abiding and desist from acts that would jeopardize the peace the country was enjoying. Ambassadors of ECOWAS countries, whose nationals were on board the ships, were also at the Port to receive them.